Both Civil War tours are wonderful! We couldn't have done it by ourselves. Everything is perfectly planned. All you have to do is go and the days are always filled with great sites and amazing information. This Hallowed Ground is one of our most memorable tours! It gives you a panorama of the major events that began and ended the Civil War, starting with First Manassas, culminating with Gettysburg and breathing the air of finality at Appomattox. The Civil War was the defining event in American history. It was an ordeal by fire that, according to the most recent historical estimates, cost the lives of as many as 750,000 American soldiers and left more than 300,000 wounded—casualties higher than all our other wars combined. We study the military campaigns and strategy and delve into the causes as well as the people who were willing to sacrifice their lives and property for their country, whether north or south. Who were those soldiers whose hearts were, in the words of Oliver Wendell Holmes, “touched by fire?” How were they trained? Until the turning point at Gettysburg, why did the Confederate officers and soldiers in the East often tactically outmaneuver, fight harder, and campaign better than the Union generals? And, finally, why did the North win? Our professional historian will lead the group and conduct informal discussions throughout the tour. We can learn from, and be inspired by, the skill, the courage, and the endurance displayed by the generation that brought us through the Civil War. In addition to retracing battles we include education sessions to enhance our understanding of the war and people. Manassas, Gettysburg, Appomattox - This tour is a study of the causes behind the conflict and the major battles that began and ended the Civil War, starting with First Manassas, culminating with Gettysburg and closing with the surrender at Appomattox. Harpers Ferry - We visit Harpers Ferry at the confluence of the Shenandoah and Potomac rivers, where John Brown staged his infamous raid that failed to incite a slave rebellion. He was captured and hanged there. Stonewall Jackson later captured the town, arsenal and entire Union garrison as a prelude to the Antietam Campaign. Antietam - Antietam was the site of the bloodiest day of war in American history when, on 17 September 1862, there were 23,000 casualties. Gettysburg - At Gettysburg we study the three days that marked General Lee’s final attempt to score a major victory in the north. Fredericksburg, Chancellorsville, Spotsylvania, Wilderness - We tour the area of four major battles: Confederate victories at Fredericksburg and Chancellorsville leading up to Gettysburg; then Spotsylvania and the Wilderness Campaign fighting to keep the Grant’s Union armies at bay. Optional pre-tour extension available on the September 2019 and October 2019 tours. Arrive at Dulles airport and take a free shuttle to the tour hotel. First group activity will be a 6 p.m. Welcome Reception followed by dinner. After breakfast, we depart from Dulles for the Manassas Battlefield. Here we learn about the events of the Confederate victory in the first major battle of the Civil War in July 1861 where Thomas Jonathan Jackson earned the sobriquet, “Stonewall.” Jackson’s steadfast position became the rallying point for the Southerners as their lines began to falter. After a stop for lunch in the town of Strasburg, we drive south to study the battles of Cross Keys and Port Republic. Fought on successive days in July1862, Jackson won victories over Union General John C. Fremont. Fremont had recently taken charge of operations in the Valley after transfer from the western theatre. Spend the night in Lexington, Virginia. This morning we head to the Virginia Military Institute, where Jackson, a professor of physics, also instructed the cadets in artillery and tactics. We walk the Parade Ground from where Stonewall led the cadets to provide security at Harpers Ferry for John Brown’s hanging in 1859 and later serve as military trainers for new army recruits in spring of 1861. We will visit the tomb of Robert E. Lee, who served as President of Washington College after the war, and the Stonewall Jackson grave site. Leaving Lexington, we proceed up the Shenandoah Valley and stop for a picnic lunch en route to New Market. Although it took place in May 1864, the year after Jackson’s death, it was a situation in which his beloved VMI cadets set out on a forced march to fight side-by-side the Confederate troops where Colonel George S. Patton, Sr. commanded a brigade. After New Market, we settle into our lodging and dinner in Winchester. In the morning, we take a tour of Kernstown, Jackson’s only setback in his campaign—and the last time he called a war council the night before the battle. Afterwards, we will study the battle of Third Winchester, tour the town and stop for lunch. We then proceed to the Battle of Cedar Creek, which pitted Jubal Early’s Confederates against Phil Sheridan in the culmination of the 1864 Valley Campaign. 90-minute drive back to Dulles airport hotel for rendezvous with the guests for the Hallowed Ground Tour. Schedule your flight to the Washington Dulles International Airport. The group will meet at a nearby hotel where we will have a Welcome Reception at 6 p.m. followed by dinner at 7 p.m.
Our program begins with a visit to the battlefield at Manassas. Both the North and South thought that a war would be short. Union leaders believed their greater resources and manpower would prevail while the Confederates doubted northern resolve. The first battle of Manassas (Bull Run) July 21, 1861 saw the proud but green Union Army facing the better led Confederates who won a decisive victory. The Union Army retreated unpursued to Washington. Innocence and illusion were over for both sides. By the time of Second Manassas at the end of August 1862, both armies had gained combat experience, but the result was an even more significant Confederate victory. Nestled in the foothills of the Blue Ridge Mountains at the confluence of the Shenandoah and Potomac rivers, Harpers Ferry is one of the loveliest places in the eastern U.S. This was the scene of John Brown’s raid in October 1859— a desperate act that hastened the outbreak of war. Brown was hanged for treason on December 2, but the raid hardened radical sentiment for he was seen a martyr in the North and a radical insurrectionist in the South. The Battle of Antietam (Sharpsburg), September 17, 1862, was the bloodiest single day battle in American history with 23,100 men killed or wounded. Although neither side gained a decisive victory, Lee’s withdrawal and failure to carry the war effort effectively into the North caused Great Britain to postpone recognition of the Confederacy. It also gave President Lincoln the opportunity to compose and later issue the Emancipation Proclamation on January 1, 1863, declaring all slaves free in the states still in rebellion. The Battle of Gettysburg, lasting three days, July 1, 2, and 3, 1863, was the bloodiest battle and the turning point of the Civil War. More than 50,000 Americans of both sides were casualties. Gettysburg was General Lee’s final attempt to carry the war north. Although nearly two years of fierce fighting still lay ahead, after Gettysburg the prospects of a Union victory changed from if to when. We will stand at Little Round Top, where the 20th Maine Regiment, led by Colonel Joshua Chamberlain, repulsed several Confederate assaults and preserved the Union position at Cemetery Ridge. This action was described by author Michael Shaara in his epic narrative The Killer Angels. Today we walk the field of Pickett’s Charge, perhaps the most famous attack in American history. As noted by historian James McPherson, “Pickett’s Charge represented the Confederate war effort in microcosm: unsurpassed valor, apparent initial success, and ultimate disaster.” Of the 14,000 Confederates who attacked, only about half returned. Some four months after the battle, President Lincoln came to Gettysburg to deliver one of the greatest speeches in American history. We will visit Shriver House, a museum dedicated to the civilian experience during the struggle. Dinner will be at the Dobbin House, the oldest building in Gettysburg (1797) and a stopping point for escaped slaves on the Underground Railroad. This morning we will return south to Virginia and visit Fredericksburg – a region of four major battles: Fredericksburg, December 1862; Chancellorsville, May 1863; The Wilderness, May 1864; Spotsylvania Court House, May 1864. 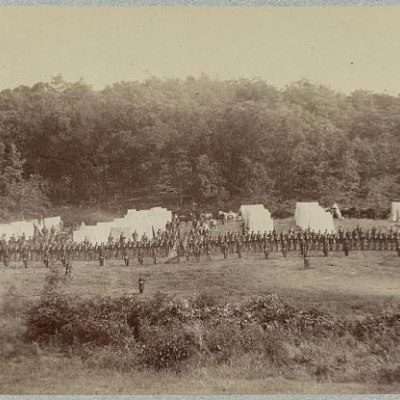 Richmond, the soul and Capital of the Confederacy, was the northern army’s main target. 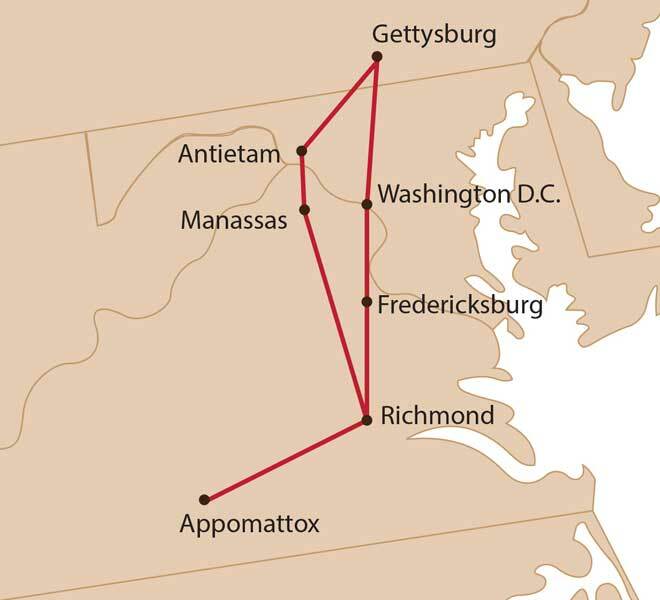 The direct route from Washington to Richmond passes through Fredericksburg. Clara Barton, later to found the American Red Cross, won fame and gratitude for her heroic nursing of the wounded of both sides. We visit Chatham Plantation, where the “holy angel” from Massachusetts worked at her makeshift “hospital.” Barton had already helped the wounded at Antietam and Second Manassas. Later, she would serve at the Wilderness and Spotsylvania and become supervisor of nurses for the Union Army of the James. Fredericksburg and Chancellorsville were decisive Confederate victories. Wilderness and Spotsylvania were tremendous but tactically inconclusive battles in Grant’s 1864 Overland campaign. After visiting Fredericksburg, we’ll continue to Chancellorsville, where we analyze the battle, see where Stonewall Jackson received his mortal wounds and discuss the aftermath. By the summer of 1864, the war in Virginia settled into a brutal siege around Richmond and nearby Petersburg that would last until the spring of 1865. We will visit the fascinating National Battlefield at Petersburg, scene of the Battle of the Crater. After walking the ground over which the battle took place, we travel a short way to visit the memorable National Museum of the Civil War Soldier at Pamplin Historical Park. The Museum tells the story of the nearly 3,000,000 Americans — northerners and southerners, whites and blacks, immigrants and native born — who fought in the Civil War. While at the Museum, we will explore Tudor Hall Plantation, which features a working kitchen and slave quarters that present a multi-media exhibit on antebellum slavery and plantation life. The final campaign began at Petersburg. the longest siege in American history, June 1864—April 1865. The siege was a precursor of the trench warfare of the First World War fifty years later. Only the considerable skill, courage and endurance of Lee’s army kept the Union forces out away from Richmond. But on April 2 the northern army broke through and cut off the Confederate supply lines from the South, forcing Lee to retreat to the west. Grant pursued relentlessly, and virtually surrounded Lee’s army and forced the surrender on April 9 at Appomattox Court House. The United States was reborn. After visiting Appomattox, we will return to our hotel for our farewell dinner. One morning transfer Dulles Airport. Because Dulles is a two-hour drive from Richmond, you will not be at the Dulles airport until 10 a.m., so book your flight after noon. There will only be one group transfer so if your flight is earlier than noon, your transfer will be on-your-own. $3,190 per person based on double occupancy. If rooming alone on tour, additional $650 single occupancy supplement. Pre-Tour extension: $1,690 per person based on double occupancy. If rooming alone on pre-tour, additional $300 single occupancy supplement. I took the Hallowed Ground Tour in May 2018 and have time to reflect on this marvelous experience. I read and watched quite a bit before the tour, but there is no substitute for visiting the sites where history was made. My highlights were standing on Little Round Top, walking Pickett’s charge, and seeing the Union river crossing site at Fredericksburg. My personal favorite was the Minnesota memorial at Gettysburg where the 1st Volunteer regiment held the Union line with an 82% casualty count on the 2nd day. Gerry P our historian was excellent in addition to his hidden musical talents. Matt B our guide was excellent as well. If you want to understand how our nation became one from many, this tour is for you. Where do I begin? I just got back from This Hallowed Ground Civil War Tour. It was not just great, it was fantastic! I learned so much from an expert authority on the Civil War, Jack Mountcastle. His wealth of knowledge and understanding of what happened was far beyond my expectation. I am still thinking of all that we saw and heard as I go about my day. Special moments will live in my memory forever. Thank you for providing this type of experience to me. It was well organized with all of our needs taken care of. I could not let a day go by without following up on our tour. The planning of the tour was over the top. The battlefields that were chosen and why they were an important part of the war, the places we stayed were wonderful and who could complain about the food! Not only was it good but in several of the establishments, there was more history. It was obvious that a lot of thought and planning went into this adventure. All of the above though would be a mute point if not for your staff. General Mountcastle was excellent. On our trip it was obvious that many had done their homework as they asked very pointed questions. Jack not only had the answers but could follow up with more information. He was able to put us right there with the feel and thought of the day. Keith Buchanan was right there as well. No one had to worry about wandering off or being left behind. You knew he was there for you and in control of our environment. He made sure everything flowed as expected. Hal was also an integral part of the adventure. The bus was clean, cool and on time. I also thought how appropriate that even though he had been on this trip before, you would see him many times out walking the field, listening to Jack and wandering the museums. It is obvious that more information can be gleaned all the time. I will be remembering this trip for years to come and sharing my experience about your tour and team. We have several friends on the East Coast and I have made copies of my material and will be sending it as an inspiration to take the trip! Please share with your staff, including Terri and the others that I may have spoken with over the phone how much they are appreciated.